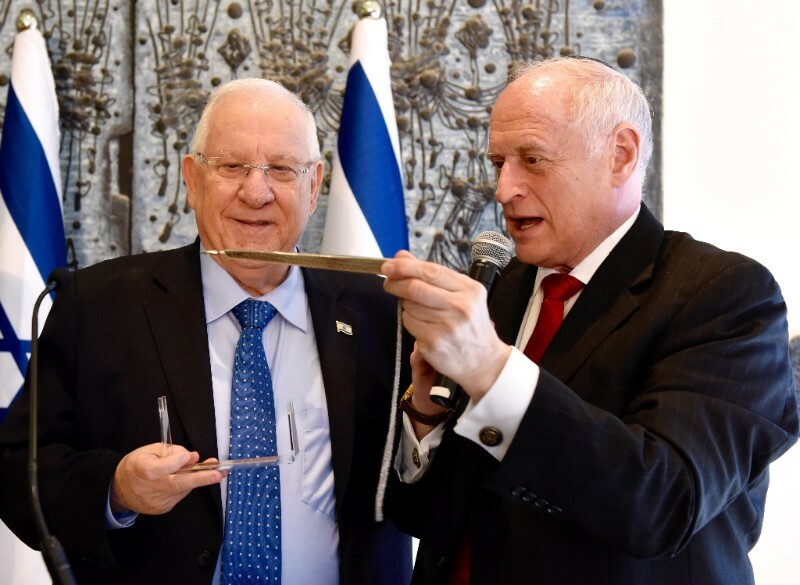 President Reuven Rivlin welcomed the delegates of the 42nd annual Conference of Presidents’ Leadership Mission to Israel at his official residence, Beit HaNasi, and told the more than 100 American Jewish leaders that he hoped that Israel would not become a divisive topic in this election season. “Support for Israel has never been and must not become a partisan issue,” he said. He also said, “There is a need to build bridges with Israeli Arabs in a confederation of minorities. It is time to establish a constitution. We have to make it possible for all the communities of Israel to know each other, it is our destiny to live together.” The President said that the real problem is with extremists who believe that incitement brings them power. The delegation had an off the record and candid discussion with U.S. Ambassador Daniel Shapiro and participated in two issue forums. The first focused on media coverage of Israel in the foreign press. David Horovitz, Founding Editor, Times of Israel, moderated the media panel with the participation of Barbara Opall-Rome, Israel Bureau Chief, Defense News; Lt. Col. Peter Lerner, IDF Spokesperson, Head of Foreign Press Branch; Udi Segal, Diplomatic correspondent for Israeli television’s Channel 2; and Josef Federman, Israel Bureau Chief, Associated Press. Horovitz framed the discussion by saying that the root of the legitimate grievance directed at the foreign media’s Israel coverage is lack of context and perspective, and that the wider challenges facing Israel are underestimated. Udi Segal said, “Israel should not be complaining about unfairness in the media,” arguing that foreign journalists should be given more access to the information they need. The panel grappled with “hot button terms,” such as “terrorism.” Ms. Opall-Rome argued that the word is loaded and often misused; she defined it as “an act of violence against unarmed civilians.” In this context she said the attack on Gilad Shalit’s tank and his subsequent kidnapping could not be considered terrorism under that definition, but the recent murder of mother of six, Dafna Meir, could, albeit with the proviso that she be identified in the press as a settler. Mr. Federman said “it has become very unpleasant to be a journalist in this country,” and that the more than 400 journalists in the Foreign Press Association were not monolithic, and added, “There is very little intentional distortion, errors are usually due to haste or carelessness, and are generally corrected quickly.” In response, Ms. Opall-Rome cited a Dubai-based journalist for Defense News who repeatedly referred to the IDF as the IOF – the Israeli Occupation Forces in his reporting, but her outlet would not permit the use of that term. The second forum took place at Bar Ilan University. Titled Strategic Challenges in the Eastern Mediterranean, it was cosponsored by the Begin-Sadat Center for Strategic Studies and B’nai B’rith. This, the concluding session of COP’s 2016 Leadership Mission to Israel, was chaired by B’nei B’rith International President Gary P. Saltzman, with the participation of Hon. Panos Kammenos, Greek Minister of Defense; Amb. Giulio M. Terzi, former Italian Foreign Minister; Maj. Gen. (res.) Amos Gilad, Director of Policy and Political-Military Affairs, Israel Ministry of Defense; and Col. (res.) Dr. Eran Lerman, of the BESA Center. Mr. Kammenos said, “The Greeks are a maritime people, the Mediterranean Sea is in our DNA.” He identified the primary threat to Eastern Mediterranean stability as ISIS and its criminal and terrorist activities; the war in Syria; Turkey’s occupation of Cyprus, and a host of other “unfriendly” policies; nuclear proliferation in the Middle East; and regional competition for influence, including an arms race among Muslim states. He called for greater security cooperation with Israel for the stability of the region and its peaceful development and prosperity. “Greece, Israel and Cyprus do not wish to participate in an axis of failure,” he said. Amb. Terzi spoke about Italy’s convening of “Mediterranean Dialogues: Beyond Turmoil, a Positive Agenda,” a regional conference held in Rome last December. “The rule of law must preside over this region and in the Middle East,” he said. He also argued for a “special partnership” between Israel and the EU, but cited resurgent anti-Semitism and the de-legitimization campaign against Israel as major obstacles. Based on our unique intelligence and military capability, he said, “We are not suffering from organized terror.” However, Gilad thinks recent wave of terror is far from over. The Maj. Gen. was optimistic the opportunities for cooperation between Greece, Italy, Cyprus, Jordan, and Israel. While he considers reconciliation between the Palestinian Authority and Hamas to be impossibility, he said that Israeli cooperation with the PA is based on common security considerations and analyses.